Digital Canal's Aluminum Design is one of the very few programs that can design aluminum structural members. While aluminum may not be the material of choice for every day structural designs, it an excellent choice in corrosive or decorative applications. Design structural aluminum members subject to axial loads and/or biaxial moments. Calculations are performed in accordance with AA-2015. Supported shapes include I-beams, channels, angles, pipes, tubes, zees. Check a specific size (Check Mode) or have the program optimize the size (Design Mode). Deflection design and dimension control. Members can be made of 6005A-T6, 6061-T6, 6063-T5 or 6063-T6 alloys. User-defined tension area reduction ratio. Automatic allowable stress for welded sections. Load inputs include concentrated and linear loads in all three directions (axial, weak axis, strong axis) as well as end moments about both axes. 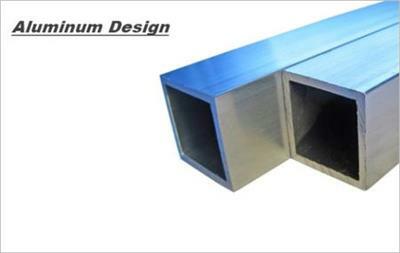 Digital Canal's Aluminum Design can be bought separately-you don't need to buy a "structural system" or "engineering library" to design an aluminum beam or column. Reports are in Microsoft Word format (RTF) giving you unequalled compatibility with other software. Flexible unit controls allow for design on various US systems. Dynamic graphic window illustrates inputs as they are entered.